Getty Images/Business InsiderThe Fox News host Tucker Carlson at Business Insider’s IGNITION conference. 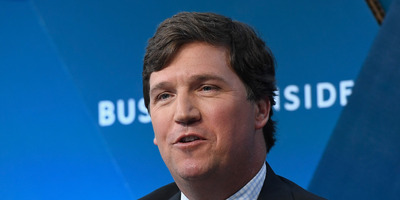 Tucker Carlson says so many people shout curse words at him in public that it’s nearly impossible for him to eat out. Carlson, who hosts Fox News’s prime-time show “Tucker Carlson Tonight,” says he has coped by finding one place where he can eat in peace. He didn’t name it. The Fox News host Tucker Carlson says he all but can’t go to restaurants in Washington, DC, anymore because he gets “yelled at” by other diners, sometimes profanely. Carlson said there was only one restaurant he still visited regularly. “I go there because I love it and nobody hassles me,” he said. In the interview, Carlson also discussed his early support for the Iraq War, praised what he described as President Donald Trump’s “bravery,” spoke about his new book, “Ship of Fools,” and gave his view on the state of US politics.